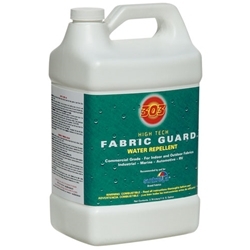 303 High Tech Fabric Guard is a premium patented formula that restores fabrics lost water and stain repellency. Recommended as the best fabric protectant by leading outdoor fabric manufacturer Sunbrella. Proper maintenance with 303 Products will add to the life of your fabrics, save you money and ... It's Easy! 303 High Techn Fabric Guard has been proven best for water repellency, stain resistance and UV screeening. It's the best alue due to superior performance, coverage and durability. 303 High Tech Fabric Guard is the ONLY re-treatment product recommned by Glen Raven Mills. 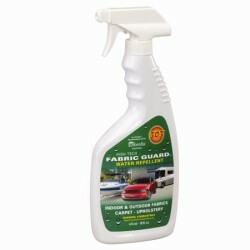 To clean and protect your fabric convertible top use 303 Cleaner and 303 High Tech Fabric Guard. It can also be used to clean and protect your outdoor patio furniture. BEFORE USING 303® HIGH TECH FABRIC GUARD (HTFG): Use only on thoroughly clean textiles, free of soiling and cleaning agent residues. For best cleaning results use 303® Fabric/Vinyl Cleaner or 303® Fabric/Vinyl Convertible Top Cleaner. Always test for colorfastness. Spray a hidden area with 303® HTFG. Wipe sprayed area with a white absorbent cloth. If any color rubs off, DO NOT USE. Use 303® HTFG on indoor and outdoor fabrics, upholstery and carpeting. For all natural and synthetic textiles and blends - solution dyed acrylic, polyester, nylon, cotton, wool, silk and fine leathers including suede. Directions: Spray until evenly wet, overlapping sprayed areas. Allow treated material to dry completely before use. Protect other surfaces from overspray. If sprayed onto adjacent surface, wipe up immediately. Note: Reduced coverage when applied with paintbrush or roller. Not for vinyl, clear vinyl, plastics, rubber, fiberglass or imitation suede. Use above 70oF. (Quicker drying/curing and best results on hot day full sun). Treated material must be protected from rain/dew until completely cured. If these steps are done correctly, at this point the material will be water repellent. Curing: 6-12 hours depending on temperature. Coverage 50-75 sq. ft. per 16 oz on lightweight fabric, 40-75 st ft. For heavier fabrics depending on material density and application method. 303® HTFG is odorless when dry. WARNING: COMBUSTIBLE: Keep product and treated article (until dry) away from heat, sparks or open flame. WARNING: Contains petroleum distillates. Use only as directed. Avoid breathing vapors. Use only in well ventilated areas. Keep persons and pets out of area until treated fabric has dried. Do not use in enclosed areas. (if using indoors use an approved MSHA/NIOSH respirator for removing organic vapors. Use fan to force solvent vapors out of the area.) Harmful or fatal is swallowed. Intentional misuse through inhalation can be fatal. Do not spray into eyes, mouth or onto skin. NOTE: Once treated article has dried, warnings do not apply. FIRST AID: SKIN CONTACT; wash with soap & water. EYE CONTACT; Immediately flush eyes with large amounts of water for at least 15 minutes. If swallowed do not induce vomiting. Call physician immediately. KEEP OUT OF REACH OF CHILDREN, STORE AT 15-32 C 60oF TO 90oF. for indoor and outdoor fabrics, awnings, umbrellas, boat canvas, auto interiors, convertible tops, carpeting, tents, rainwear, snow skiing apparel, silk, suede. BEFORE USING 303® HIGH TECH FABRIC GUARD (HTFG) Use only on thoroughly clean textiles, free of soiling and cleaning agent residue. For best cleaning results use 303® Fabric/Vinyl Cleaner or 303® Fabric/Vinyl convertible top cleaner. always test for colorfastness. Spray a hidden area with 303® HTFG.Spray a hidden area with 303® HTFG. Wipe sprayed area with a white absorbent cloth. If any color rubs off, DO NOT USE. Use 303® HTFG on indoor and outdoor fabrics, upholstery and carpeting. Directions: Spray until evenly wet, overlapping sprayed areas. Allow treated material to dry completely before use. Protect other surfaces from overspray. If sprayed onto adjacent surface, wipe up immediately. Note: Reduced coverage when applied with paintbrush or roller. Not for vinyl, clear vinyl, plastics, rubber, fiberglass or imitation suede. Use above 70oF. (Quicker drying/curing and best results on hot day full sun). Treated material must be protected from rain/dew until completely cured. If these steps are done correctly, at this point the material will be water repellent. Curing: 5-12 hours depending on temperature. 303® HTFG is odorless when dry. COVERAGE: For most fabrics and canvas: 500sq ft. per gallon and higher, with proper sprayer and application techniques. Coverage primarily depends on material density. Greater coverage on lighter weight fabrics, less coverage on heavier fabrics and carpeting. 40 psi): 01= 1 gallons/minute flowrate; 15= 15 gallons/minute. "E" means and even dispersal across the radius of the fan. directed. Avoid breathing vapors. Use only in well ventilated areas. Keep persons and pets out of area until treated fabric has dried. Do not use in enclosed areas. (if using indoors use an approved MSHA/NIOSH respirator for removing organic vapors. Use fan to force solvent vapors out of the area.) Harmful or fatal is swallowed. Intentional misuse through inhalation can be fatal. Do not spray into eyes, mouth or onto skin. NOTE: Once treated article has dried, warnings do not apply. KEEP OUT OF REACH OF CHILDREN, STORE AT 15O-32O C (50O - 90Of).